Lose Weight with Sunrider Archives - Sunrider More Energy, Laser-Beam Thinking, Vibrant Health! 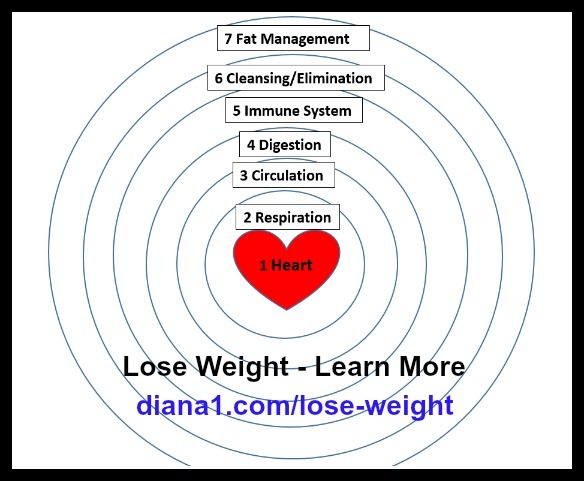 Lose Weight – We had a wonderful webinar today with Brad Mummery. 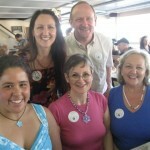 Trudy Stoelting and Diana Walker led the Sunrider Lose Weight “Burning the Fat” webinar. Watch video featuring Guest Brad who lost 45 pounds in 7 months using the Sunrider Lifestyle, with special emphasis on Fortune Delight, Metashaper, Metabooster, and Suntrim Plus. Trudy’s Amazing Explanation – and she guides you in learning about your body’s priorities. The body will take from the systems which are less important. Of course Endocrine (Heart) and Respiratory (Lungs/Breathing) are HIGH priorities, so other systems will be compromised soonest, because the body places the highest priority on keeping the Heart pumping and the Lungs breathing. Fat Metabolism is very low down on the priority scale. The weakest system pulls down the other systems. FAT MANAGEMENT Least important, lowest priority for body. Not life-threatening. Sunrider Sunfit Lose Weight – Being overweight is one of the most common manifestations of malnutrition. Extra pounds are symptoms of imperfect nutrition and lifestyle patterns that need revision. Dr. Peter Lindner, American Society of Bariatric Physicians, Specialist on Obesity. Sunrider Weight Loss and Weight Management is different! The Sunrider nutritional products works in harmony with the theme of Regeneration. This means the focus is to regenerate the body’s fat maintenance process whereas most other diet programs focus on weight loss with little regard to how it is accomplished. results in temporary weight loss and a feeling of hunger and fatigue. High protein diets have merit as they fill you up. This stops you from consuming as many simple carbohydrates, which is the main cause of our society being so over-weight, along with processed foods, and lack of exercise. The problem with high protein diets is animal protein can overload digestion, which creates fermentation. This is very unhealthy for the body. Animal protein is acidic and higher in fat than plant protein. and can lead to health problems. The failure rate for most diets remains at a dismal 95 percent. The weight loss programs that claim astonishingly high success rates are generally ignoring dropout rates and successful maintenance, which is what matters in the long run. WEIGHT LOSS IS EASY; KEEPING IT OFF IS HARD! “It is actually comparatively easy to lose weight; what is hard is keeping it off! When you look at a person five to ten years after the person dieted, the failure rate approaches 98 percent.” Ellen Hopkins, Newsday. YOUR BODY WILL HANG ON TO THE FAT! When you stop eating food on a regular basis, to lose weight, the body will HANG ON TO FAT! !… thinking that it is in a famine and that it better save the fat for fuel. The body starts burning lean tissue for blood sugar instead of fat! Another reason for the body doing this is that it takes more energy to burn fat than it does muscle. Reducing calories too much makes it almost impossible to burn fat. The result is that you lose weight (muscle and water weight) but not fat. In contrast, the Sunrider Weight Loss, Weight Management program emphasizes Fat Management. Sunrider provides highly nutritious whole foods in a concentrated form. Cravings and Fatigue are the two most difficult problems to combat while establishing dietary control. When you use this program, your body will experience fat loss. The Sunrider foods will help you keep it off by balancing your body and keeping your cravings for unhealthy foods to a minimum. With busy schedules, few people closely monitor the foods they eat and often consume what is convenient. Sunrider has two choices of nutritionally dense foods to add to your program, Nuplus and Vitashake. Nuplus and Vitashake are both essential and are considered basic herb food staples. * before or after exercise. They help reduce cravings for unhealthy foods and contain no preservatives. Feel free to contact your sponsor in Sunrider with any questions you may have. comes in five delicious flavors: Pina Banana, Mixed Berry, Apple Cinnamon, Simply Herbs, and Original. Nuplus contains mainly vegetables and beans depending on flavor. 3 grams of protein per serving. Simply Herbs and Original Nuplus both consist of 100% complex carbohydrates and Original Nuplus is formulated with no beans. The Nuplus fruit flavors consists of 91% complex carbohydrates and 9% simple carbohydrates. Ingredients: Coix Lacryma, Soybean Seed, Chinese Yam, Fox Nut, Lotus Seed, Lotus Seed, Water Lily Bulb, Green Bean, Red Bean, Black Bean, White Bean and Imperate Root, and depending on flavor, Apple, BlueBerry, Banana and Pineapple. comes in 2 delicious flavors, Chocolate and Strawberry. 4 grams of protein per serving. Overall, it can be a little more satisfying than Nuplus and even though it contains a touch of milk and added sweetness, consumers with food sensitivities love it. Ingredients: Coix Lacryma-Jobi Seed, Stevia, Soy Protein, Alkali Processed Cocoa Powder, Fructooligosaccharides, Natural Flavor, Chinese Yam, Fox Nut Seed, Lotus Seed, Lotus Root, Water Lily Bulb, Potassium Phosphate, Calcium Phosphate, Imperata Root, Magnesium Oxide, Stearic Acid, Carrageenan, Calcium Carbonate, Soy Lecithin, Xanthan Gum, Manganese, Niacinamide Ascorbate, Chromium, Fumarate, Molybdenum, Selenium, Vegatable Oil, Vitamin E, Zinc Oxide, Copper Gluconate, Calcium Pantothenate, Vitamin A, Vitamin B6, Thiamin, Riboflavin, Folic Acid, Biotin, Iodine, Vitamin K, Vitamin D, and Vitamin B12. FORTUNE DELIGHT: assists the natural elimination processes to remove impurities from your body. Many of the undesirable elements that we take into our bodies are eliminated, while others are stored and even trapped in the body (especially in fat cells). Fortune Delight complements the natural processes, assisting in elimination of wastes and impurities. Fortune Delight is a very important part of the Sunrider Weight Loss program. Drink 6 to 8 cups per day any time. Mix 2-3 cups of water per 3gram pack. Ingredients: Camellia Extract, Chrysanthemum Flower Extract, Jasmine Extract and Lalang Grass Root Extract. are very effective at balancing blood sugar. Most people are on the blood sugar rollercoaster every day. This is caused by the consumption of sugar, refined foods and foods that convert to sugar quickly. Allowing blood sugar levels to rise is one of the main reasons people have difficulty burning fat. A half glass of unsweetened juice could easily be enough to raise blood sugar levels. When this happens the pancreas produces insulin to lower sugar levels. One of the side affects of insulin, is it coats fat cells and makes it almost impossible to burn fat for four to eight hours. Sunrider Suncare (Stevia) is sweet to the taste but converts to glucose slowly, so just a few drops can balance blood sugar for three-four hours. 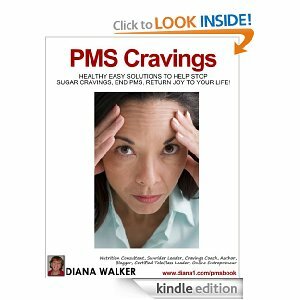 While helping blood sugar, can help reduce sugar cravings. There are no preservatives, it contains no calories and is safe to use throughout the day. The main ingredient is Stevia Extract and is combined with Chrysanthemum Flower to perfect and preserve the formula naturally. Suntrim Plus encourages healthy eating habits and is ideally taken 30-45 minutes before meals. * high in antioxidants to help with anti-aging. Start with 2 –3 capsules twice or three times per day before meals and increase as desired. Note: When some people start on Suntrim Plus, they experience what seem to be cramps or they may become nauseous. If this happens, make sure you are drinking a cup or more of Fortune Delight with the Suntrim Plus. If it persists, try adding a small amount of food or a piece of Sunbar. You could also reduce the amount to one capsule per serving, for a week or more. Ingredients: Theobroma Cacao Extract, Green Coffee Bean Extract, Green Tea Extract, Garcinia Fruit Extract, and Polygonum Cuspidatum Extract. The Sunrider Sunbars is a very nutritious meal replacement bar. 120 calories per 30-gram bar. Eat 1 to 2 per day at meal times, or as a between-meal snack. Drink a cup of Fortune Delight or water with each bar. Root, Coix fruit, Soybean oil and Wheat Germ oil. 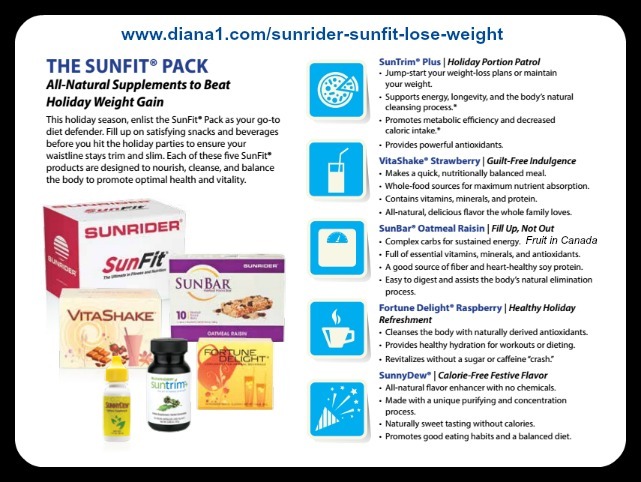 If your goal involves weight management, improving fitness, or simply living a healthier lifestyle, then the SunFit® Pack is for you. Easy and enjoyable to integrate into your daily routine, this selection of herbal-based products is ideal for people of all ages and fitness levels. The SunFit® Pack includes Sunrider® products to put you on track to the body you’ve always wanted and features Sunrider’s weight-management superstar, SunTrim® Plus. is a ground-breaking product that works within 30 minutes to help you feel fuller so you don’t overeat. As you continue to take it, SunTrim® Plus can help you achieve and maintain a healthy weight by encouraging healthy eating habits. Our concentrated herbal formula contains powerful ingredients such as cocoa bean, green coffee bean, resveratrol, green tea, and mangosteen. Fortune Delight® provides healthy, natural hydration backed by the power of antioxidants to promote the benefits of SunTrim® Plus while harmonizing with the body’s natural cleansing process..
VitaShake® is a whole-food powder with fewer than 100 calories a serving, no cholesterol, very low sodium, and very low sugar, making it an ideal supplement to help achieve your weight-loss goals. SunBar® provides true nutrition and sustained energy in a concentrated herbal food bar. Rich in fiber and protein, it is made with whole-food ingredients such as dried fruits, legumes, soy, and nuts. substances and helps in oxidizing fats. Many people comment on the increased energy they experience and how much faster they heal from injuries of all types when consuming MetaBooster. Start with 2-3 capsules twice or three times per day and increase as desired. Ingredients: L-arginine, Acety-L-Camitine Hydrochloride, Alpha Lipoic Acid, L-lysine. this hormone can cause a variety of problems in the body—the storage of fat around the midsection, inflammation, and thyroid issues to name a few. Metashaper helps naturally reduce the over production of cortisol in the body. Metashaper is also very high in antioxidants, and increases metabolic efficiency. Start with 2-3 caps twice or three times per day and increase as desired. Ingredients: Tea Concentrate, Garcinia Concentrate, Soy Concentrate, Polygonum,Concentrate. It’s common for our body to store a variety of different forms of toxicity and fat in different areas of the body, the pouch under the chin, lower back fat, lymph etc. Slimcaps help eliminate waste that is stored in all areas including the lymph, liver, kidneys, and small and large intestines. You feel very clean when you use Slimcaps. When Dr. Chen released Slimcaps he explained it as “helping squeeze the fat out of the body.” People often use Slimcaps for regularity also. Start with 1 to 2 capsules per day and increase if needed. Ingredients: Capillary Artemisia Stem, Gardenia Flower (gardenia augusta), Chinese Rhubarb Root, White Peony Root, Aehmannia Root, Chinese Goldenseal Root (coptis chinensis), Baikal Skullcap Root, Phellodendron Bark, Aloe Vera Leaf, Saigon (cinnamon bark), Mushroom Powder (poria cocos), Tree Peony Root, Chinese Thoroughwax Fruit. cravings persist after consuming Nuplus and Suncare or Sunectar. You can also open a capsule and put it in your mouth. Vitataste allows you to taste the elements behind sugar and intensifies the taste of salt in the food you eat. You will be shocked at how for the next 2-3 hours, you won’t taste the sweetness in anything you eat or drink, but the taste of salt is intensified, while healthy foods like vegetables and raw nuts, for example, will taste even better than before. from the cake for example, but won’t be affected by the sugar. Start with 2-3 capsules, two or three times per day or as needed. Ingredients: Lycii Fruit, Wuxue Teng, Coix Fruit, Lotus Seed, Lotus Root, Water Lily Bulb, Imperate Root and Fox Nut. Note: This information is not intended to diagnose or treat illness. Always consult a physisian before starting an exercise or fat management program.